Enjoy the freedom of cruising McLaren Vale’s famed Shiraz trail at your own pace, on your own terms. Cruise up to 25 km/ hr on your electric mountain bike, with your Shiraz trail map in hand, and complimentary snacks of delicious local produce. Journeying through this region has never been more fun. No blood, sweat, and tears – just incredible vistas, good food, and wine made by some of the most passionate winemakers in the country. McLaren Vale is a sweeping landscape of incredible diversity and riches, from stunning coast to world-renowned vineyards. Your pedal assist 250-watt e-bike means travelling through this breathtakingly beautiful region has never been easier. Enjoy the famed Shiraz trail at your leisure, and get an insider’s look into the passionate winemakers and processes behind making some of the best wines in the world. Set off with a complimentary backpack bursting with a selection of juicy condiments from the region, a Shiraz trail route map, and your trusty e-mountain bike and explore the beauty, culture, and natural landscapes of this deeply special region. 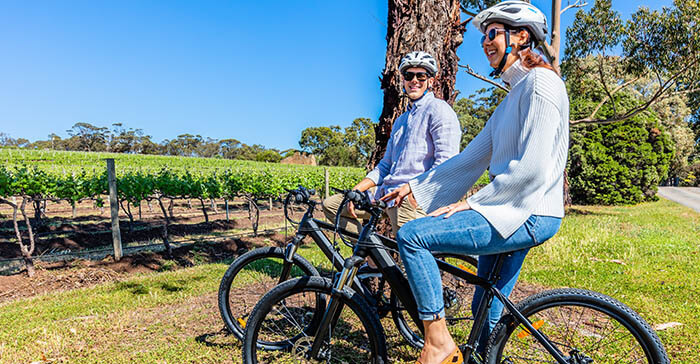 Whether you’re staying with us or in the region, our self-guided e-bike tour is the easiest, most enjoyable way of exploring McLaren Vale‘s famed Shiraz trail.